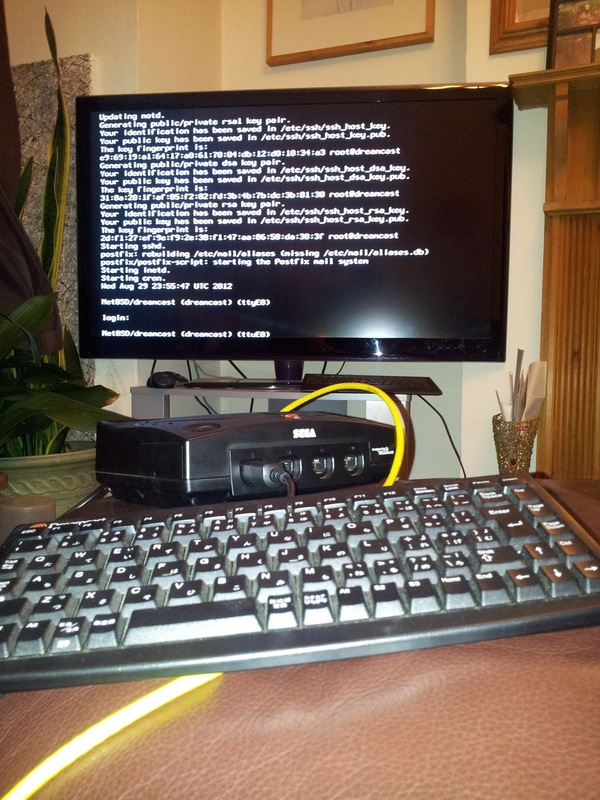 NetBSD0: Retrochallenge 2012 - public access Dreamcast? 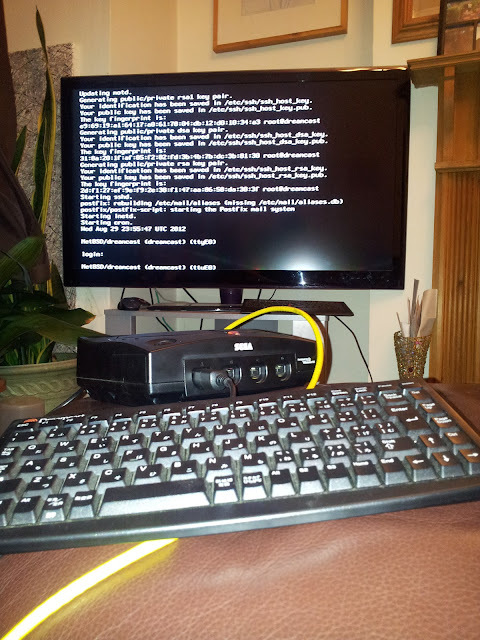 Well, the opportunity to comply with both of the above rules in one task is too good to miss, so onwards with my plan to setup a Sega Dreamcast as a public access *nix server, using a DEC VAXstation 4000/90A as a netboot and file server. The plan suffered an early setback when the Dreamcast I acquired turned out to have a Japanese 110V power board which steadfastly refused to work with any 110V power supply I used. Fortunately the Bay-of-e has a ready supply of UK Dreamcasts with functional 240V power boards, quite cheap - particularly if you are willing to include a cosmetic condition of "Appears to have been used regularly as some form of dinner receptacle, also possibly slightly chewed by dog"
A few moments with a screwdriver and my UK powered Japanese Dreamcast powers up with a NetBSD-5.1 CD in the drive. The first thing I notice is its loud. I think louder than the VAXstation (as the VS is around 5.5miles away its difficult to tell for sure, but last time I checked it didn't have a 2cm fan making a valiant attempt to bore its way out through the case). The second thing... the bottom two lines of the console are invisible. This provided a sufficiently convincing representation of "bizarrely hung" for my initial joy at the dmesg to pass through a selection of profanity before I worked out what was happening. Hmm, this could be too easy... maybe once the Dreamcast is up I can try building simh on it and set it up to emulate a VAX? Looks like fun! I've oft wondered about using my dreamcasts for something useful... trouble is I have no BBA to allow it to link to anything, and the prices don't seem to be heading anywhere close to down ... good luck with this!